In our overpopulated world, stuffed with an ever-growing stockpile of products, offline experiences have become key to personal fulfilment. While 78% of millennials choose to spend money on a desirable experience over something material, the trend extends beyond just young people, to every age bracket and socioeconomic class. This tidal wave is already having extreme effects on the global economy and traditional business models. It requires a fundamental shift in how we look at everything, from revenue growth to personal happiness. Ultimately, the shift to an experience economy has the power not only to change how we spend our time and money, but also to promote inclusion and democratize happiness. Products from every corner of the globe are easier to acquire than ever before - and many of them are even shipped for free. This ubiquity leads to commoditization, which drives down the perceived value of these objects. One company that has continued to thrive is Lego, even as many households have reached saturation point, stuffed with toy building blocks. The company has launched in-store experiences and conventions accessible to all socioeconomic groups, designed to encourage collaboration and help build children’s cognitive skills. While many commoditized toy companies have faded in the digital age, Lego has doubled down on creating offline experiences that create connection and brand affinity. When diamonds are no longer rare, and the world’s increasing number of urban residents are no longer interested in owning a car, rare experiences become the new social capital. Nowadays, the world’s biggest celebrities tend to post far more Instagram “humble brags” in exotic destinations than photos of new fur coats. The means and time to create unique experiences are this era’s luxury goods. Many would argue that this trend toward an experiential economy is not a trend at all, but rather a realization of the longevity of human happiness. Professors Thomas Gilovich and Amit Kumar of Cornell University study the relationship between wealth and happiness, and conclude that “experiential purchases, such as vacations, concerts and meals out, tend to bring consumers more enduring happiness than material purchases, such as high-end clothing, jewellery and electronic gadgets”. According to the researchers, experiences create more lasting happiness because they are more open to positive reinterpretation; they tend to become more meaningful parts of one’s identity; and they do more to foster social relationships. Experiences help us learn, grow and connect with each other, so it’s no surprise we choose to spend our money and time on them. 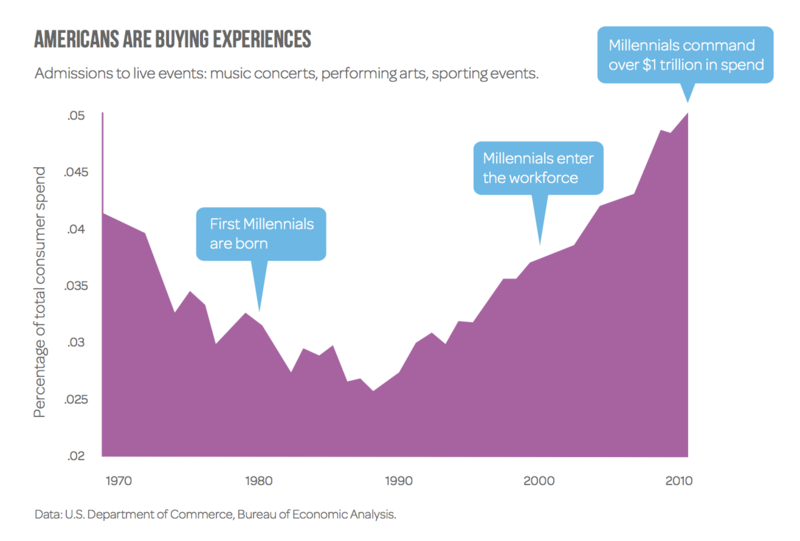 Since 1987, the share of consumer spending on live experiences and events has increased by 70%, relative to total US consumer spending. The importance of human experience is not new, but this massive shift has been waiting for the perfect moment - rampant overconsumption and the social platforms to amplify it. Physical retail is dead. Its extinction is accelerating as malls close, chains go bankrupt and next-day delivery makes a trip to the store seem pointless. Many of the brands that we grew up with - Toys ‘R’ Us, RadioShack, Rite Aid, Sears, Sports Authority and Claire’s - are closing their shutters. The stores that kept malls expanding through the 1990s have turned into business school case studies about the impact of digital disruption. Why take hours to visit a toy store when Amazon gives better customer service, cheaper prices, informative reviews and fast delivery, with no need to wait in line? The only companies that will exist in 10 years’ time are those that create and nurture human experiences. This learning and growth will come from maximizing opportunities, including the reinvention of retail spaces, new models of engagement, and an understanding of experiences as perhaps the most important form of marketing. Red Bull built its global empire on allowing people to experience the personality of its brand. Lululemon builds community by offering free yoga classes in its stores. Patagonia and REI both focus on experiences - trips, hikes, and classes - as core parts of their business. These experiential initiatives create emotional bonds between consumers and brands, frequently having ten times the return on investment compared to digital marketing and building measurable loyalty. The brands that embrace the experience economy - and the data that powers it - are the only ones who will thrive. As the forces of the Fourth Industrial Revolution accelerate, consumers are enjoying the benefits of rapid innovation and new models of consumption, but also struggling to maintain a sense of connection and understanding our rapidly changing world. In that context, it should be no surprise that experiences, especially transformative ones that educate, inspire and bring people together, are growing in popularity. Crossroads Foundation, a nonprofit organization based in Hong Kong SAR, created the popular and emotionally jarring “Refugee Run”, a 75-minute experience in which guests “become” refugees. In a basement fitted out as a refugee camp and staffed by refugees from around the world, the immersive experience brings adults to tears, creating more empathy than a lecture or article ever could. Crossroads has created further immersive experiences in order to build awareness of global issues, understanding that “when people have stepped, even briefly, into the shoes of others, the conversation changes and they are considerably more motivated to engage”. While experiences have the power to make the global economy more inclusive, this must be an intentional priority. The internet is largely a great force for inclusion, but with 45% of the world’s population lacking access, it can also widen the gap between socioeconomic groups. Given that experiences can enhance learning, increase social connection and ultimately transform the global economy, we have a responsibility to design the experiences of the future in ways that reach a diverse range of individuals and benefit the planet. As we continue to invest in the experience economy, our greatest challenge may be ensuring access and inclusivity while maintaining personalization and uniqueness.